Laura and I sure like to bend an elbow now and again, especially on Fridays after a week of work. Sweet liquor eases the pain. And I've been working very slowly through my Mr. Boston Official Bartender's and Party Guide for fun. So, every once and a while I'll share with you a post on a new drink that we're trying. Our alcohol-tinged focus was on mojitos a week and a half ago. 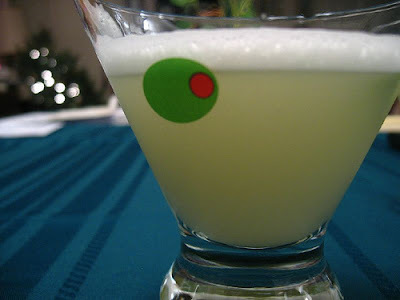 This week, our drink of choice is the Gimlet. It's a little reminiscent of a gin and tonic, but more limey. Perfect for a summer day (or in light of the crappy cold weather we're having lately, perfect for dreaming of a summer day). Delicious! A cocktail shaker (something like this or this would be fine. I would go with something with at least 16 ounces of capacity so you can easily mix two drinks up at once). Pour 1 shot lime juice and 1 shot gin into a cocktail shaker. Add 1 teaspoon powdered sugar (can add 1-1/2 teaspoons for a slightly sweeter drink) and stir with a spoon until sugar is mostly dissolved. Add ice, close up the shaker (this is one of the more important steps to remember) and shake the heck out of it. Strain into a martini or cocktail glass. I also add a little lime peel or a wedge of lime for garnish. * Full Disclosure: if you purchase any of the items via the links provided, I receive an exceedingly small affiliate fee. Thanks, this is our favorite drink. We order it all the time, even in the worst bar, I think it is really tough to mess up. Diana. They don’t know how to make them here. What they call a gimlet is just some lime or lemon juice and gin with a dash of sugar and bitters. A real gimlet is half gin and half Rose’s Lime Juice and nothing else. It beats martinis hollow. Ahhhh, a fellow connoisseur of literature!! !